This lentil dish was a pleasant surprise. When you have been cooking legumes for as long as I have now been cooking them it is easy to get into the habit of combining them with the same flavor profiles until you are basically always making variations on the same dish. If it is a dish that you like there is nothing wrong with that, but every once in a while it is nice to pair things up in a new way so that your taste buds are surprised. 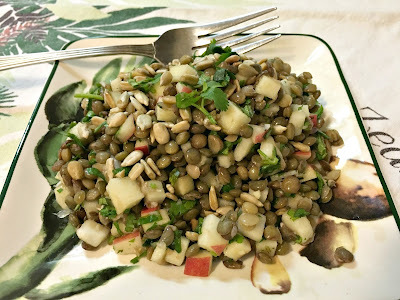 The ginger and apple provided a sweet and pungent kick that jump-started my taste buds and gave me a new appreciation for lentils. Which is a good thing, because they are a powerhouse of nutrition and I try to eat them often. Toasted sunflower seeds add a nice crunch and some body, but I made the mistake of mixing them all into the salad rather than keeping them on the side. As a result, they soaked up the dressing and lost their lovely toasty texture in the refrigerator and the leftover servinsgs were not quite as tasty as that first serving. So in the future (and as I have indicated in the recipe) I will keep them separate and add them as a garnish just before serving. If you are looking for a new way to prepare lentils that will wake up your taste buds, then this Apple and Ginger Lentil Salad is definitely for you. Cover the lentils with about 2 inches of cold water in a large saucepan. Bring to a boil over high heat, then lower the heat and simmer the lentils until they are tender, about 25 minutes. Drain. Whisk together the oil, lime juice, ginger, honey, salt and pepper in a large bowl. Add the hot lentils and stir to coat well. Refrigerate for at least two hours. Add the apple and cilantro just before serving. Garnish each serving with about one-and-a-half tablespoons of the sunflower seeds.